© Tumbalina. All rights reserved. 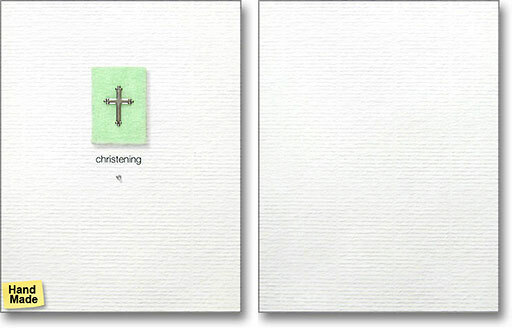 A delicate metal cross is mounted on pale green felt. A tiny crystal bead is affixed just below the text. Tumbalina greeting cards are the passionate creation of Oak Atkinson. Oak began making collage greeting cards in a tiny town in Uganda, where she grew up. A former marketing executive, Oak found her true calling in making people smile through cards that convey love and affection in a personal, whimsical way. Elegantly minimal in design, each card is handmade and carefully crafted by Tumbalina "elves" in Westchester County, NY. These artisans attach delicate embellishments to the cards, creating three-dimensional works of art.